When I signed in pro ball, I was 3/4-overhand. For my first pro season the Angels left me alone. I did pretty well, had a 3.00 ERA. During Spring Training the following year they decided to try dropping me down. They felt my velocity wasn’t where was gonna be able to get MLB hitters out. Probably around mid-80’s. I overall was throwing out of the same arm slot, I was just bent over to create lower arm slot. I was able to get more movement and my slider was more effective from there. I actually helped a pretty famous submarine pitcher in dropping down, Dan Quisenberry. I was drafted in the 12th round out of the University of La Verne. I went back in the off-season to work out with them and Dan was a Sr. there. I told hm to try dropping down and pitch sidearm. He had a great Sr. year but didn’t get drafted. Eventually he did sign as a free agent with the KC Royals. 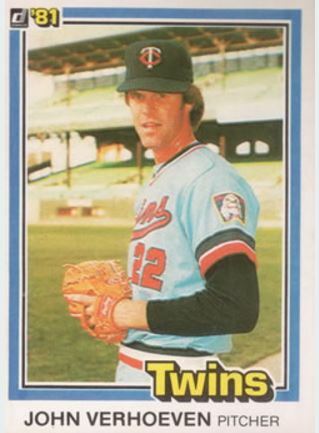 He got up to AA as a sidearm pitcher but the Royals wanted him to drop down lower-submarine like the Pirates’ Kent Tekulve. They were playing the Pirates in Spring Training and Dan worked with Kent for 15 minutes. Ended up pitching that day and threw well. He made the Royals and never looked back, eventually winning Fireman of the Year award for top reliever. My advantage was the sink I was able to get. Also the lateral movement I could get with my slider. Overall I was the same velocity from there, didn’t lose any. Angels used to rate everyone’s fastball 1-5, 1 being the best that was Nolan Ryan. They gave me a 2 which was the 3rd best in the organization. There wasn’t radar guns back then, I know I wasn’t the hardest thrower but it was based on the hitters’ reaction facing me. Overall probably not but I hate to look back and think ‘what if’s” I felt my stuff was good enough from over the top but listened to the Angels when they suggested I drop down. My first year in the minors though, I had one outing where I walked 3 batters then fell behind 3-0, then strike out the side on the 9 pitches in a row. After that outing, my pitching told me you’re gonna pitch in the big leagues. After my playing days, I was a head coach and a pitching coach. Never did have a lot of success in dropping anyone down. Found they would struggle with their command or their breaking ball. I think if you are going to be successful with it, it has to some naturally and have to be able to pick it up pretty quickly. Just like Quisenberry did, dropping down has to be like water to a duck. I think there is also a certain body type too. Quiz tried to teach me on year in Spring Training to go lower and throw submarine. I just couldn’t go that low like him. Dan was flexible though, he could put his knee around his neck! I would say from sidearm, you should be throwing across your body a little bit. Give or take 3-4 inches I believe. You are going to be in a stronger position there to generate power. Submarine is different though, Quiz used to tell me you gotta open up more. That makes it easier to use lower half effectively from that low of an arm slot. One thing I was told later on by Brian Downing who owned me at the plate is that I gave away my slider. I would raise my arm angle when throwing it. So make sure repeating the same arm slot on all of your pitches. I was sinker-slider…could never get a change-up like Gene Garber. Sometimes I wonder if I did end of having a change I would have been more effective and spent more time up. I would sometimes just throw a BP fastball. I would slow my arm down when throwing but my motion was so funky that hitters weren’t able to pick it up. Righties- I pitched them away exclusively in the MLB. Found when went down and in on them all they had to was drop the head on it and it was gone. Both slider and fastball just tried to stay away. You could tell they weren’t comfortable in the box and with my arm slot. If they were gonna beat me, it was gonna opposite field where the ball would stay in the park. Lefties- I just really tried to work both sides of the plate against them. Had to show them I was capable of coming inside on them to keep them honest. For me I guess it would be breaking bats. Not as much in the MLB since was pitching guys away more, but in the minors when coming in and then getting that nice jam sandwich broken bat.